Baggersee. With an unprecedented heat wave hitting the northern hemisphere, I eventually found my annual vacation blog post. I wrote blog posts about our beach vacation in Marielyst, Denmark, or Rehoboth Beach, Delaware. However, this year, it took me the better part of two weeks to realize that I had this year’s beach right beneath my feet – the small artificial beach of the Rossenray Lake, a small lake in my home town in Germany where we spent our summer vacation. And here are the three things the beach (and the lake) told me about science in 2018. Rossenray Lake. This year’s summer blog post is about the small lake where I learned how to sail. Competitive dinghy sailing was my main sport during my teenage years and has left a deep impact on me, especially with regards to how I deal with challenge, stress, and disappointment. I thought that I would put together a motivational blog post for 2018 using the lake as a topic. Motivational posts. I have taken the liberty in the past to occasionally write motivational blog posts that connect personal experiences with larger scientific questions in the neurogenetics field. 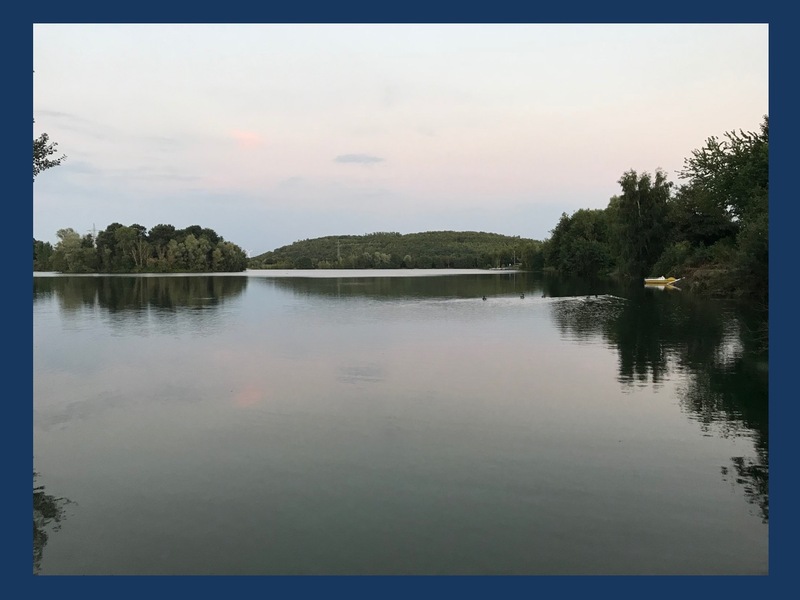 I wasn’t quite sure that I wanted to put together such a post this year, but when I decided to hop into the Rossenray Lake one late evening after an exhausting day in the summer heat, I found myself standing on our small, manmade beach and realized that I had found the topic for my summer blog post. I have an unusual affinity for lakes that stems from my time as a competitive sailor during my teenage years. This time period is always formative and Rossenray Lake has probably had more of an impact on my overall way of thinking about the academic landscape than a flooded gravel pit is assumed to have. Gravel pits. Here is a bit of geography to set the stage. During the past million years, and particularly after the last ice age, the Rhine River ran through various different riverbeds, slowly polishing millions of tons of gravel that were left in the ground after the Rhine changed its course into the current river bed. Mining gravel is still a worthwhile business, and the necessary consequence is that entire areas that are excavated subsequently fill with water. Over time, these excavated gravel pits become their own small ecosystem and are also used for sailing, diving, fishing, and all sorts of recreational activities. Therefore, translating the German word “Baggersee” (literally digger-lake) to water-filled gravel pits falls short of the usefulness of these quarry lakes for people living nearby – over the last 60 years, these lakes have been used extensively – and I learned how to sail on our local water-filled gravel pit that is referred as the Rossenray Lake (Rossenrayer See). From sailing on a small lake, I tried my luck in competitive sailing and – to make a long story short – here are my three things that I took away that are relevant for neurogenetics. 1 – Spontaneous ideas. My career in competitive sailing started somewhat spontaneously on a Thursday afternoon. A friend and I had heard that there was a competition on a nearby lake. The competition was a large, national regatta, and we were contemplating whether or not we should join. I remember that our coach approached and said, “Spontaneous ideas are the best ideas,” and we signed up for the competition. In neurogenetics or science more broadly, you are sometimes in the position to make wide-ranging decisions. It may be a new position, buying an expensive scientific instrument, or accepting a new collaboration or invitation for a far-away conference. The thought that spontaneous ideas are sometimes acceptable has helped me in my scientific career to prevent overthinking and procrastination. In fact, there are many situations where you might feel the need to add more arguments, but in fact your decision is already made. 2 – King of the Lake. What sounds like a wonderful beginning to nice childhood story, ended somewhat badly. When competing on the weekend following my wide-ranging decision on Thursday, I did very poorly. Unexpectedly poorly, in fact. I was one of the best competitors on our small lake, but it took me by surprise how unexperienced I actually was. For some reason that I can’t really remember 30 years later, I decided to continue rather than quit. I realized that it meant very little being King of the Lake and that the national standards were much, much higher. With regards to science, we also tend to live in different spheres. There is the local stage of our own laboratory where you can be a stellar researcher. But this may in fact mean little if you don’t have a good idea of the other levels out there. Being locally respected in your laboratory or graduate student group may be comforting and help you create an identity, but don’t leave out the national or international stage where your performance may be judged differently. 3 – The cunningham. There is one moment during the national German championship in Travemünde that I still remember. Prior to every competition, many sailors compare their speed by racing against each other. Back then, my dinghy was brand-new, the wind had the ideal strength for me, but still, I was not as fast as I used to be. Somewhat paradoxically, I pulled the cunningham tight, one of the ropes that allows you to trim your mainsail. This was supposed to be a heresy as there were at least three theoretical arguments why the cunningham would shape your mainsail in a way that was highly disadvantageous to your speed. However, it did the trick for me and I was fast again. My take away message from this? I like technical explanations and knowing how and why things work – and this fully applies to neurogenetics. However, don’t be surprised if your results in a model system or your theoretical predictions don’t translate in the end. It may be your patient who reacts adversely to a medication you surely predicted to work or your assumption that a given protein would be too important to ever be involved in human disease (I mistakenly made this assumption with GRIN1 a few years ago). Basically, in the same way that the interplay of wind, waves, and navigation occasionally makes your speed on the water unpredictable, the complexity of the human brain may occasionally be hard to model. This entry was posted in 2018, Motivation, Opinion and tagged beach holiday, Rossenrayer See. Bookmark the permalink.